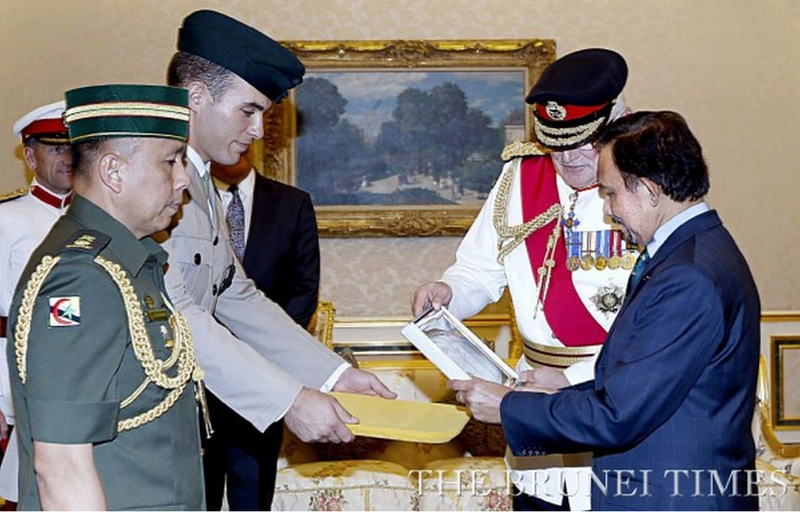 His Majesty The Sultan and Yang Di-Pertuan of Brunei granted an audience to General Sir Peter Wall, Colonel Commandant of the Brigade of Gurkhas, at the Royal Palace of Istana Nurul Iman on October 12, 2015. The audience followed a Commemoration Parade marking 200 years of Gurkha service to the British Crown held at Bandar Seri Begawan’s main ceremonial parade ground at which the Sultan took the salute and met soldiers and families from British Forces Brunei. General Sir Peter was accompanied by His Excellency Mr David Campbell, British High Commissioner to Brunei Darussalam; Colonel Mike Page, Defence Advisor to the British High Commission; and Colonel James Robinson, Head of the Brigade of Gurkhas. During the audience, The Sultan recalled with pleasure the Gurkha Pageant and Dinner at the Royal Hospital Chelsea which he attended with The Queen and The Prince of Wales in June. General Wall welcomed the close collaboration that existed between the Garrison and Royal Brunei Armed Forces and presented His Majesty with a picture of Her Majesty The Queen with The Sultan at the Gurkha Pageant. Also present during the audience were Deputy Defence Minister Dato Paduka Hj Mustappa Hj Sirat and RBAF Commander Pehin Datu Pekerma Jaya Major General Dato Paduka Seri Mohd Tawih Abdullah.